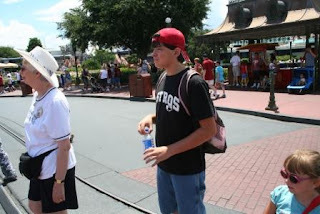 On Monday, we went to Magic Kingdom - the mecca of most Disney World goers! 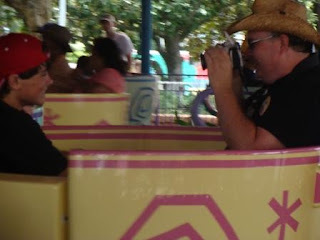 One could easily spend two or three days at Magic Kingdom alone. There is so much to do and see in one park. 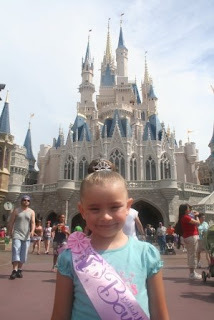 Of course, one of the main reasons we were there was the Magic Castle so that Miss Emily could have her Princess Makeover! 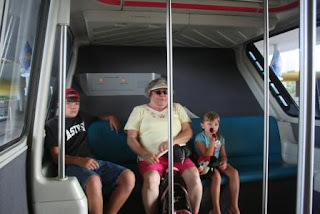 We decided to ride the Monorail from our drop-off at Epcot over to the Magic Kingdom. 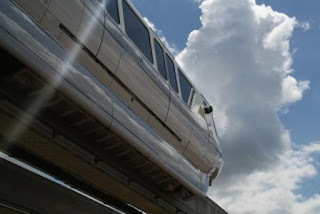 We did not realize that we would have to get off one Monorail and get onto another, however. 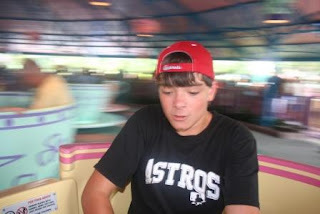 If we were to do this over again, I think we would have just hopped a Disney bus. The line at the Monorail exchange was HUGE! Of course, when we got there, I made Shan and Emily pose in front of the castle! We are actually just inside the park at this point, but the castle is so big, you cannot help but get a great "posed" shot! Tyler, Emily, and Mimi all look on as Mickey and Minnie perform in front of the castle. As we got there, they were just finishing up one of the many shows they put on. Before we got to this point, we had seen the Monsters, Inc. Laugh Floor, which was an interactive show! 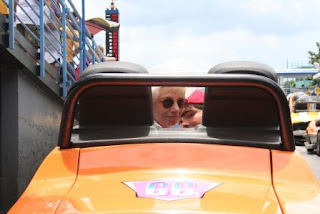 Tyler and my Mom rode in the car ahead of me at the Indy Raceway in Tomorrowland. The cars go VERY slowly. Emily did not want to ride them at first, but when she saw how slowly the cars drove, she and I went on it later. After we got out, one of the 'cast members' asked Emily if she had her license. She said no, and he pulled a special one out of his pocket for her! It was great! 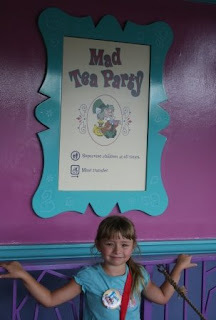 Emily's main choice of things to do at Magic Kingdom was to ride the TeaCups! Tyler and I got our own cup so that we could spin as fast as we could make thing go around. Honestly, I have no idea how we did not get off puking our guts up! Shan took the one of Tyler and me. How she got us while we were spinning was awesome! I took over 300 pictures at Magic Kingdom, and I will eventually post them to my Picasa account with a slideshow (as well as the other pictures I took).